​A great but often overlooked feature of Google+ is communities. Google+ communities provide the perfect platform for discussion and sharing resources / best practice. They’re also another great way to connect with other educators. Communities can be found by using the built-in Google+ search facility. Click on the search icon (top left hand corner of the Google+ toolbar) and type in a keyword e.g. ‘Education’ + ‘Teachers’ etc. Google+ will return a list of results based on your keywords. You can also find communities by looking at the interests of people you follow. Once you’ve found a community that interests you, click on the ‘Join’ button. Note: Some educational communities will be closed. This means that your join request must be approved by the administrator of the group before you’re allowed to join. Closed groups are identified by the ‘Ask to Join’ button instead of the usual ‘Join’ button. Once accepted, you will be able to post, comment and like posts as normal. 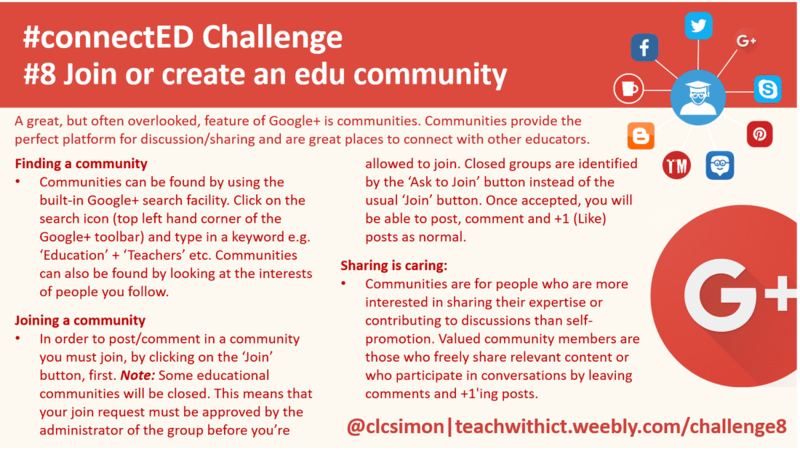 Use the built-in Google+ search facility to find education related communities. 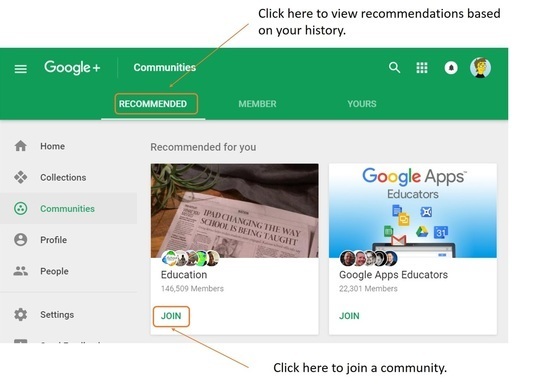 As well as being a great place to share best practice, education Google+ communities are also a great place to find other educators to connect with. To find other educators to connect with, click on the members tab above the community title. Click on a member's name to view their public profile and connect with them. Can’t find a community that interests you? Then why not create your own community and invite other educators to join! Click on the 'Communities' tab. Click on 'Create a Community'. Enter a name, make the Community public or private, decide if people need to ask to join the Community, and whether member posts are held for review until the member has been approved to post in the Community. You can also add categories, links, and a description. In the Navigation menu, click Communities . Click the Community you want to edit. Write a welcome post: When you create a community, write a post to set expectations about what you want to see in the community and welcome new members. Experiment with your posts to learn what your members like: Try posting different types of content, like pictures, questions or general updates. The posts that get the most comments and +1s will help you learn what your members like the most. Sharing is caring: Communities are for people who are more interested in sharing their expertise or contributing to discussions than self-promotion. Valued community members are those who freely share relevant content or who participate in conversations by leaving comments and +1'ing posts. Tags: ​google+, teach, using google in education, teachers guide to google+, Join or create an education community, Google+, top social media platforms, top social media sites, top 10 social media websites, top social networking platforms, main social media platforms, different social media platforms, most used social media platforms, Google+ use.